Your Ultimate Guide to the Most Beautiful Waterfalls in the World. If you’re like me, and visiting Iguazu Falls is on your bucket list, then you have come to the right place. This beautiful group of waterfalls, making the list for “7 Wonders of the Natural World” rightfully deserved, is exquisite. It puts Niagara Falls to shame, sadly. Iguazu means “big water”, and that it is. It consists of between 150-300 water falls. This number hugely fluctuates depending on the season and water levels. I’m happy I went beginning of February, because although it was wet season, the falls were thriving, powerful, and the water levels were very high, making it a magnitude of an experience. It was sweltering hot though. Iguazu is taller and twice as wide as Niagara, and even wider than the enormous Victoria Falls in Zambia/Zimbabwe. “Devils Throat” or “Garganta del Diablo” is 80 meters high and has several falls that join together to create one of the most epic viewpoints in the falls. Iguazu was created due to a severe volcanic eruption that left a crack in the earth. When Eleanor Roosevelt visited the falls, she immediately said “Poor Niagara.” Iguazu spreads 1.67 miles down the Iguazu River. It is a UNESCO World Heritage site. It sits in two countries, Brazil and Argentina. You must visit both sides to get the best out of your experience. There is a local legend of the falls, that thousands of years ago, a God was set to marry an Aborigine girl against her will. She escaped in a canoe from him on the river with her mortal lover. When he found out, legend says, that he was in such a rage, that he split the river in two, and created all the water falls, so that the two lovers would be condemned for eternity there. I mean, I’ve made some ex boyfriends mad, but this is a bit extreme, perhaps not for a God though. They historically and mythically always were dramatic and threw fits of rage. Okay, so here is all the information you need when visiting! The best time to visit Iguazu Falls;This totally depends on what you can tolerate and what you’re willing to trade. I went in February, summer and rainy season. I came then because hotels were cheaper, the falls have high water, meaning they are going to be extra full and powerful. It was more crowded, but not as bad as it could be in Spring. It was extremely hot and humid. I was okay with the heat, as to me experiencing the best of the falls and to see the greenest the jungle was around the falls was worth it. The one thing you risk with coming during wet season is rain. It’s a rain forest, so it’s likely. Some days it will rain for a couple hours and stop. The first day we had sunny skies, the second day, we had thunder storms and rain, which wasn’t ideal, but I guess it gave a different feel to the place. Luckily, we were on the Brazilian side that day so the best photos are really in one insanely amazing spot. I grinned and bared the rain and just allowed myself to get wet. I did wear a hat that day luckily and I bought a super cheap poncho, so it wasn’t as bad as it could have been. Some people literally just had bikinis on walking around. They were bold. If you go in the spring and fall, like some sites recommend, it may be drier, but it’s not as pretty and green and the water levels aren’t as high so there may be less falls. This place is so magical and exquisite, that anytime you go, it will be an experience you never forget. Anytime will also have its benefits. You just should decide what’s the most important to you. How to get to Iguazu Falls; Getting to Iguazu Falls was easy for me, but I was coming from Chilé, so I was already in South America. There are two airports you can fly into. There is Foz do Iguaçu (IGU) on the Brazilian side, and then Cataratas del Iguazu (IGR) on the Argentinean side. Flying from America, you will have to connect most likely in Rio in Brazil or Buenos Aires in Argentina. Both are amazing cities you could add into your journey and stop over en route there or back. I flew into IGR from Chilé on the way there, but I flew out of IGU on the way out as after, I was heading to Rio. I would check the prices into both, and a lot depends if you are going somewhere before or after. One thing to keep in mind is Argentina is one hour behind Brazil. Make sure you are at the airport at the local time as I could have missed my flight flying out of Brazil as I was staying in Argentina and didn’t realize the hour time difference. Both airports are small and easy to navigate and truly one isn’t much better than the other. Like I said, it really depends on the price and where you are coming from and going on to after. Also, if you do fly in or out of Brazil, or plan to visit the Brazilian side of the falls. You MUST have a Brazilian visa. The visa is now an E-visa and much easier to get than it used to be. It cost me 40 USD online and I had it in a day. You just print it off and keep in in your passport to show. It is good for unlimited entries in a 90-day period. From the airport, you can get taxis safely and cheap to wherever your hotel is. I stayed on the Argentina side. How Long do you need at Iguazu Falls? I would go to the area for 3-4 days depending on the season. We stayed 3 nights there but it’s good to have an extra day just in case you get a thunderstorm or rain like we did, unless you really aren’t bothered by seeing one side in the pouring rain. 3 is a must as you’ll need your day you arrive to get settled in to the hotel and chill and then the next two days for the parks (falls). We arrived in the afternoon, went and explored the little town, enjoyed our lovely hotel and drank Pina Coladas at the pool and then the 2nd day we awoke early to go to the Argentinian side. You need a full day here as it is a lot of walking and there is a lot to see. There are also cool boat rides you can take if you want. You need a proper full day here, some trails take an hour or so to walk so when I say a full day, I mean it. Trust me, I was someone who read a full day, and was like, “whatever, I see stuff quick in cities, this is for slow walkers and people who sit and gaze for ages at things”. No, you need a full day, you don’t want to rush. It’s hot, there is a lot to see, and you also need to take turns at the vantage points as there are so many people trying to get photos. Like, in devil’s throat, I think I had to hang out a good 30-45 minutes just to get a turn to get a photo without a ton of people walking in front of the camera or photo bombing me. So, take your time and enjoy it. I would say also go when it opens as it gets very hot throughout the day, so the earlier the cooler and less humid it is. The price fluctuates but when I went it was about 20 USD to get in. They do take credit card there. On the Brazilian side, you only need 3-5 hours or so. There is only one main trail you walk, and at the end of that, is a beautiful long dock, where you walk out literally at the bottom of the falls. It’s the best view on the Brazilian side. The water is spraying everywhere and so powerful and beautiful. It was raining the day I went so I just succumbed to getting soaked not only by the rain but by the falls spraying on you, so be careful with your phone and camera or better yet, get water proof stuff for your electronics. On the Brazilian side, you can also rent a helicopter to see the falls. I think it’s about 100USD for 15-20 mins but that could be outdated information. I didn’t do the boats of helicopters as I truly felt like I had such a magical experience just on the trails, but I had a friend who said the boat ride really was the highlight of his experience there. You should expect to get soaked on those as well, so bring appropriate shoes and clothing and a change of socks or undies if possible. I wore a swimsuit which is also a good idea. What side or Iguazu Falls is better? I think this is one of the questions I get asked the most. It was also something that everyone in South America had an opinion on. Some said Brazil, some said Argentina. Some only had went to the one side and said it was the best, which I found funny to have an opinion if you haven’t been to both. You can’t really make a fair opinion. Both offer such a different experience, and after going to both, I would say you really should try your hardest to get both done. If you must choose only one side, then hands down, it’s absolutely the Argentinian side. No questions asked. The difference in the sides, is that on the Argentinian side you have the famous and best viewing area in my opinion “Devils Throat” or “Garganta del Diablo” which falls into the Paraná River. This marks the border of Argentina and Brazil. It is 269 ft. tall, 490 ft. wide, and 2,300 ft. long. Two thirds of the falls are on the Argentinian side. There are also 3-4 trails on the Argentinian side compared to the one on the Brazilian side. The falls are divided between the upper and lower falls. There is more of a variety of falls on the Argentinian side, and a variety of trails as stated. When you are on top of Devil’s throat you are literally at the top, looking out over the falls. There are many viewpoints on this side but the one down side is that you don’t get to see the full scale of the falls all at once and end up taking pics at loads of different viewing points. It is not rare to see rainbows here, I even saw a double rainbow. How cool! The Brazil side is epic as well, but to me, had a lot fewer viewing points. 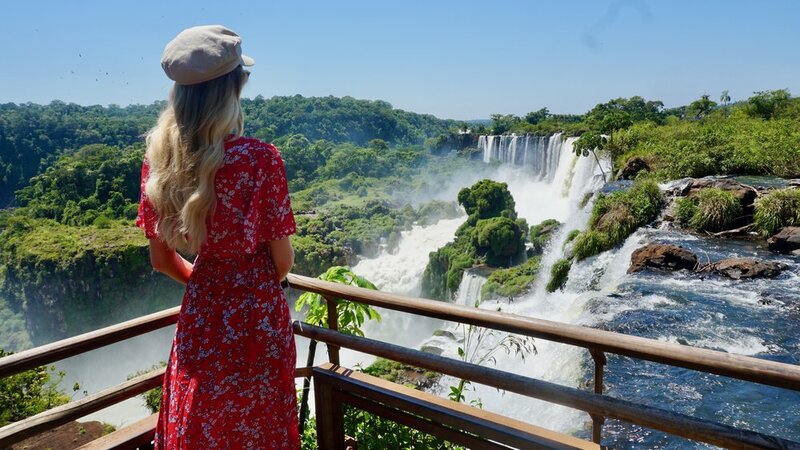 The great thing about the Brazilian side though, is that you are down below the falls, and you can take a dock out to where you feel you are right in them and you get epic panoramic views of the Argentinian side. I feel like when you are on the dock of boardwalk out, you really get a feel of just how powerful the falls are. You can see Devils throat from the top on the Argentinian side or be in it on the bottom on the Brazilian side. The Brazilian side also has a cool bird park where there are loads of different birds. The Brazilian side does feel more crowded because there are less trails, viewpoints, and one main boardwalk where everyone wants their photo of the panoramic views. I honestly made it a point to see both sides as both were magical and epic and so like I said, try to see both. Both sides are around 20 bucks but remember, the Brazilian side requires a visa that is also needed before arrival into Brazil at 40USD online. Also, don’t be surprised if you see rainbows from both sides. It’s very common and makes for gorgeous photos! Remember, cabs are cheap in the area, so it cost us slightly more to go to the Brazilian side from Argentina but not much. If you fly into Brazil and stay on that side, you don’t need a visa to enter Argentina as an American. If you aren’t from the US, I would check online visa requirements and any landing taxes they may have. 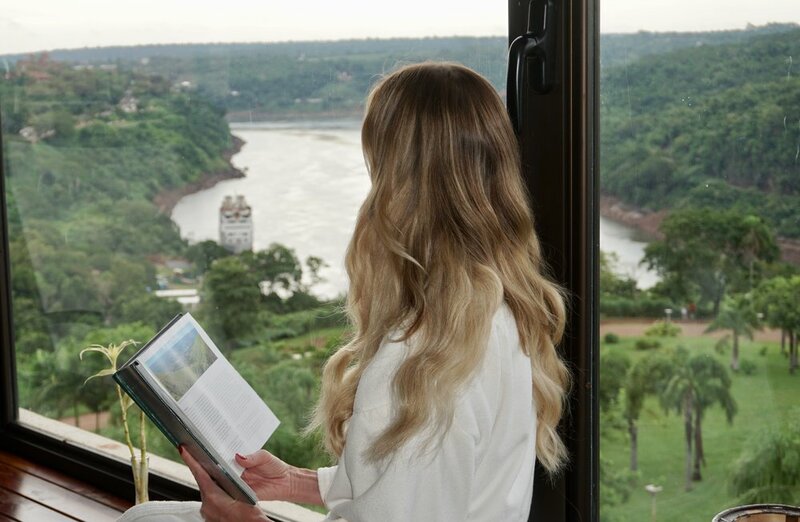 Best place to stay in Iguazu Falls; PANORAMIC GRAND! 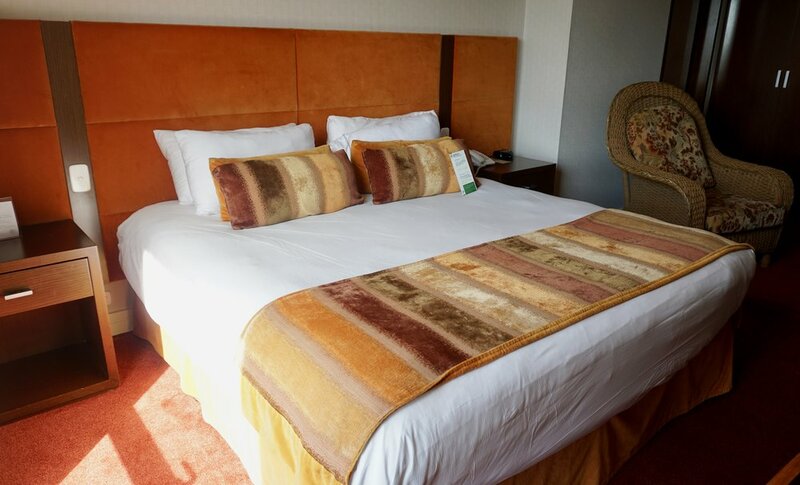 There are a few nice hotels worth staying in when visiting the falls, but as far as budget, location, and amenities, I chose the Panoramic Grand hotel. The staff were so lovely. It sits just above the river and offers river views from the hotel. The spa is on the top floor and has panoramic windows in it, providing beautiful spa views while relaxing or in the Jacuzzi. The view was my favorite part of this hotel. It has the best in the area. There is also a casino on site. The rooms were large and were priced generously. I thought it was worth the price. You don’t spend much time at your hotel, while in the area, as you will be at the falls a lot, so to me, it’s not worth spending hundreds of dollars. 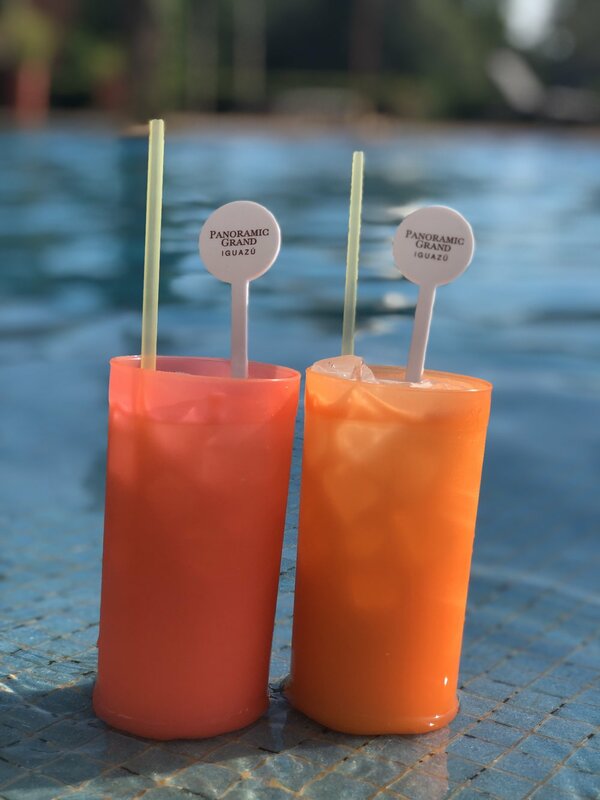 This hotel has an amazing pool and Jacuzzi area, and a great bar, where I had amazing and super cheap cocktails. The sunset from this hotel is also stunning. You get amazing views of the river and the Three Frontier Landmark aka as a “Tri-point”, where three borders connect. The breakfast at Panoramic Grand was also very good and plentiful. They can arrange taxis for you also which is super handy. What do you wear at Iguazu Falls? I think it’s a pretty obvious thing to say, but you are going to waterfalls. You should expect to get wet. I wore a bikini and shorts the first day. I wear tennis shoes, as you need good shoes for walking. I would also pack some flip-flops in case and an extra pair of bottoms and socks if permitting. The second day I went, I knew it was going to be rainy and cloudy so I wore jean shorts, tennis shoes (which got soaked), a little hat, a sweatshirt, and I bought a cheap poncho there. I also took a waterproof small backpack so my things wouldn’t get soaked and ruined. I would pack sunscreen and bug spray. Also bring some snacks and water with you. There are food stands there also but loading up on water is vital as it does get very hot and you walk a lot. Also, I packed a cute dress for photos I could just throw on over my swimsuit you will see in the photos, I do this a lot when I visit cool places that require hiking first, as obviously, you won’t want to hike in a dress. Pack sunglasses also as it does get bright. I mentioned before waterproof things for your electronics isn’t a bad idea either as even on a sunny day, at Devil’s Throat you will get wet with the mist from the falls. 1. The falls take credit card to get in, but the shops and food stands inside don’t all take them, so it’s good to have local currency on you as well. If you run out of local, some places will take USD. 2. 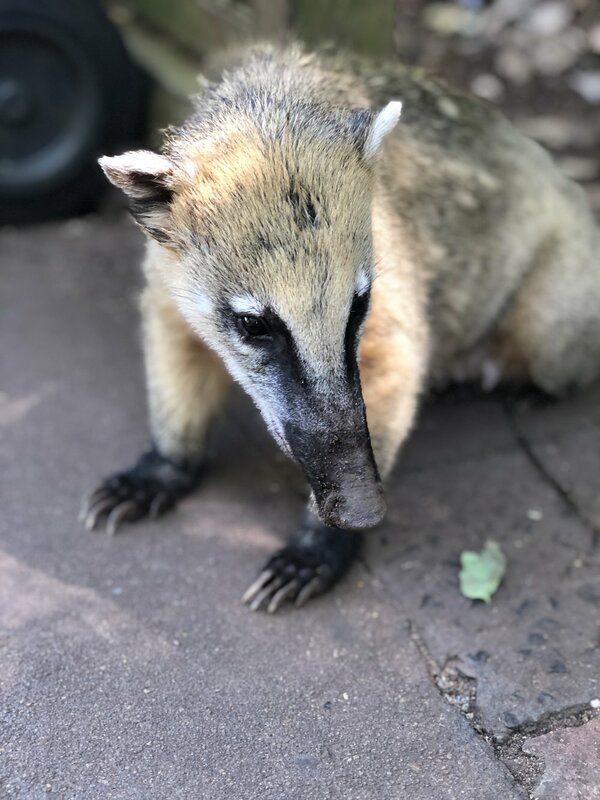 There are a lot of Coati, they look like a big crossover between an ant eater and a raccoon, but act like monkeys in the way that they will try to steal your food. They will chase you for it. So, hold your ground to them, even in packs. They rarely bite, but can if you try to pet them, so don’t. There are also Iguanas walking around, they won’t bother you if you let them be. They are more afraid of you anyway, but they’re cool to see. There are also caiman, which are like mini crocodiles. Be sure never to try and touch or feed these animals, or you could be asking for trouble. There are insects and mosquitos. Make sure to bring your deet bug spray. It’s essential. There are other large wild animals and snakes in the park. Hopefully you don’t run into any wild jaguars! 3. If you decide to visit the Argentinian side two days in a row, keep your ticket. You will get 50 percent off the second day. 4. If you want to do the helicopter or boat rides, you can book them the day of with no hassle. Remember to dress appropriately for the boat as you will get soaked. 5. I can’t say enough, do not forget to get your VISA, as an American you must have one to step foot into Brazil. It needs to be printed. 6. Walk from Panoramic Grand to the Tripoint, an area where all borders meet at the river. Paraguay, Brazil, and Argentina. It’s cool to stand one one border and see the other two. I think that’s all you need to know before going to Iguazu. I covered it all in the body of the blog. If you have any more questions, please don’t hesitate to ask. It is also safe here, so no need to worry about that! Also remember Argentina speaks Spanish and Brazil speaks Portuguese. Knowing a few basic words in each language goes a long way. If anything, at least learn how to say, “thank you” in both. A thank you and smile will go a long way. “Gracias” in Spanish and “Abrigado” in Portuguese. Enjoy your time, take lots of photos, and remember to also be present and take in the place. It will be one of the most incredible places you’ve ever been to in your life!